The Working Girl's Shoe Closet: Why So Blue? My last trip to the Big Apple frigid as it was, allowed me the chance to finally make a real trip to Top Shop. I have been salivating over their shoes for ages now. But more than that, I have been SO nervous to actually buy their lovely shoes without trying them on first. Once I was inside, I was like a kid in a candy shop and I thought to myself what the HELL WAS WRONG WITH ME? These shoes are HEAVEN! In my missing the Cali warm sun, I gravitated to these pretty ‘Wendy’ wedges. I literally MELTED into these from how utterly soft the leather is on these sweet wedges. I adored the twisted leather front strap. 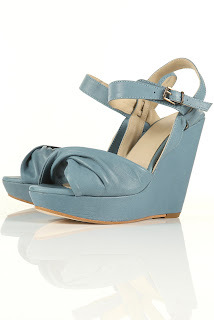 It was so very 40’s retro but modern with the wedge for this summer’s fun lovin’ city romping. They are my new weekend fun staple go to shoe in the weird LA semi-humid summer heat. The ankle strap is so unbelievably soft that they are really comfortable to wear, so much so that you almost forget you have them on! And being 4 ½” high, its sorta hard to believe but with the suppleness of the leather, you are loving ALL the benefits that these sweet wedges give you. Aside from being this Summer’s “It” shoe, the wedge gives us ladies the height of a heel with the stability and support of a flat. Oh, did I mention that they are on sale for only $60?!?! Yeah, um, I did pay full price ($125) for them but you know what? They are STILL a great deal. BUT, benefit from my find ladies, and get them now before they run out. Truly, these are you’re new Summer Lovin’ Fun shoe… Cheers to being Blue!